Most cats will be dressed up for Halloween. As scaredy-cats. 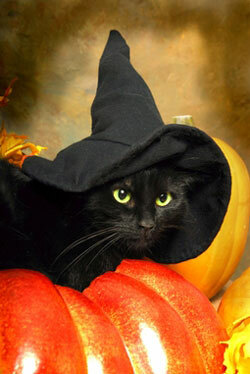 Unfortunately, cats generally do not like all the commotion that accompanies All Hallows’ Eve. Be sure to take some simple precautions with our Halloween Cat Safety Guide to ensure a safe holiday for everyone, including your feline friends. Cats are very territorial and may get agitated with so many strangers coming to the front door. Since many of these strangers will be wearing costumes and the doorbell will be ringing more than usual, cats may experience greater anxiety than usual. Consider keeping your cat comfortable in a room away from the front door. Have plenty of toys and treats to keep them busy. If you will be leaving your cat at home while you go trick-or-treating, perhaps you can get a pet sitter to make sure your cat remains calm. If not, make sure she is comfortable, and has plenty of fresh water and food available. As you greet trick-or-treaters, make sure that your cat stays inside. Even if your cat is normally allowed to wander outside, you may want to keep your cat indoors on Halloween because there will be a lot of strange sites in the area. Also, if your cat is black, be especially careful to keep your cat inside because statistics have shown that people sometimes harm black cats, especially during Halloween. As you know, cats are extremely quick, especially when startled, so make sure that your cat is wearing a collar with proper ID tags, even if your cat is microchipped because contact information on tags will lead to a quicker return home if they escape. Halloween is a great time to check ID tags to make sure that the information is up-do-date and legible. Be careful to store candy properly so your cat doesn’t eat anything harmful. As you can imagine, most Halloween candy can be dangerous for pets, including your kitty. Luckily, most cats are picky eaters, and are unlikely to eat candy that they find; but of course, you should be careful that your cat does not eat chocolate, candy corn or any candy that has high sugar content. Also, sugar-free gum is very dangerous to cats and can cause seizures, or fatal liver damage. Since there will be a lot of candy lying around before and after Halloween, make sure that curious cats don’t eat something that is harmful. Halloween is a fun time of year and you can make sure that your scaredy-cat is a safe cat by following these simple tips.